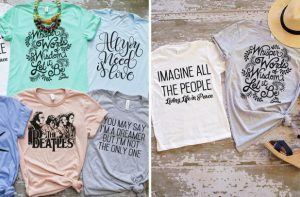 Beatles Inspired Tees in Youth and Adult sizes are only $13.99 plus shipping. Sizes range from toddler to 2XL. Unisex fit; if you are an adult, order down for a fitted look or correct size for a boyfriend-type fit. Printed in Oklahoma studio.